Teachers fulfill unique needs in the lives and development of our younger citizens; for children whose needs go beyond what is usually available in the classroom, the teacher is even more crucial. Students can have a wide range of learning, mental, emotional, and physical disabilities. Teachers make sure that lessons and teaching strategies are changed to meet individual needs. If you have a desire to experience this rewarding challenge, a career in special education can lead to numerous employment opportunities. At MTSU, you can take the important first steps by choosing to major in Special Education in the Department of Elementary and Special Education. The program covers grades K-12 and includes meeting Tennessee requirements for licensure. Individuals trained to teach special education bring a desirable range of expertise and creativity to planning and administrative roles. Graduates completing their teacher preparation at MTSU are found in public and private school classrooms throughout Tennessee and in many other states. 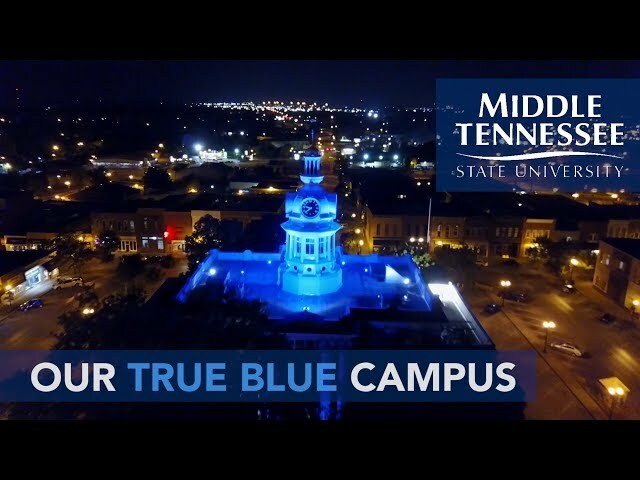 Educators who studied at MTSU are employed in a variety of settings that include the Tennessee Department of Education and other state agencies, community colleges and universities, Head Start programs, and tutoring services. Graduates are employed in public and private schools and school districts throughout the country as well as in Tennessee. The Department of Elementary and Special Education offers the Master of Education (M.Ed.) degree with major in Special Education and concentrations in Early Childhood (preK-grade 3), Mildly/Moderately Disabled Students (Interventionist K-8, 6-12), and Severely/Profoundly Disabled Students. The Department of Elementary and Special Education offers an undergraduate major, leading to the Bachelor of Science (B.S.) degree, in Special Education with a choice between the Interventioist program, K-8 or 6-12 (individuals with mild/moderate disabilities) or comprehensive program, K-12 (individuals with severe/profound disabilities). Other undergraduate majors offered in the Department of Elementary and Special Education and leading to a B.S. include Early Childhood Education (grades Prek-3), Elementary Education (grades K-5) and Interdisciplinary Studies (6–8). Students wishing to teach in secondary schools must complete a major in the subject they wish to teach and a minor in Secondary Education in the Womack Department of Educational Leadership. Directed teaching and applying for and receiving teacher licensure complete the preparation process. Other M.Ed. programs include a major in Curriculum and Instruction with a concentration in Elementary School Education and a specialization in Initial Licensure. An M.Ed with a major in Literacy is offered. Graduate minors are offered in Special Education, Reading, and Curriculum and Instruction. The Doctor of Philosophy (Ph.D.) in Literacy Studies and the Doctor of Education (Ed.D.) in Assessment, Learning, and School Improvement are available in the College of Education. Special Education, Mildly/Moderately Disabled Students Concentration, M.Ed. The Department of Elementary and Special Education offers the Master of Education degree with a major in Special Education and concentrations in Mildly/Moderately Disabled Students and Severely/Profoundly Disabled Students. The Mildly/Moderately Disabled Students program could lead to an add-on endorsement in either K-8 or 6-12 Interventionist licensure. Students seeking admission to the Master of Education program must have an undergraduate GPA of 2.75 or higher or a minimum of twelve hours in special education at the graduate level with a GPA of 3.00 or higher. Applicants must take the Miller Analogies Test (and obtain a minimum score of 385) or the Graduate Record Exam (obtaining scores on the Verbal and Quantitative measures which normally exceed 146 and 140 respectively [current scale] or 400 [former scale] with a total combined score that normally exceeds 286 [current scale] or 800 [former scale]). Applicants must have a teaching license in special education for admission to the program in Special Education with a concentration in Mildly/Moderately Disabled Students and one of the academic Interventionist pathways. Candidates without the appropriate license may be admitted to the graduate program as non-degree-seeking students. Once licensure requirements are met, candidate may reapply for admission to the program in special education. A candidate not licensed in special education must apply for a waiver to the license requirement by signing a waiver form stating that he/she wishes to receive a master's degree in special education without a license to teach. The Master of Education in Special Education with a concentration in Mildly/Moderately Disabled Students with an Interventionist pathway requires completion of a total of 33-39 hours for licensure and 33 hours for non-licensure. Candidates must successfully complete a capstone project (e-portfolio) to be taken in the last semester of coursework. Theories and techniques of providing instruction to exceptional individuals. Designed for individuals without prior specialized experience and/or course work in special education. Not for degree credit. Prerequisite: Admission to Teacher Education program. Analysis of current issues in the field. Emphasis on the analysis of relevant research. Supports and supplements supervised student teaching in a special education resource setting. Directed clinical teaching experience using socratic seminars, reflection, case studies, presentations, classroom observations, discussions, and discourse analysis. Discusses requirements of the edTPA. Candidates will receive support from seminar instructor, cooperating teacher, and supervisor during the student teaching and seminar experience. Presents skills necessary to conduct classroom research for the purpose of improving learning opportunities for diverse learners. Collaborative and co-teaching models and how to implement them in the inclusive classroom. Emphasizes RTI, collaborative teaching, differentiated instruction, explicit teaching, the affective domain, and accommodations and modifications. Aspects of the CSEFEL model integrated throughout the course. Students develop an understanding of differing educational theories and expand upon them to create their own educational philosophies. Prerequisite: Admission to Teacher Education program. Identifies and implements evidence-based reading interventions and strategies. Incorporates writing deficits; how to identify students with reading disabilities, administer curriculum-based assessments, determine skill level, determine appropriate interventions, assess intervention outcomes, and adjust interventions when needed. Prerequisite: SPED 6300. A variety of tests and assessment tools within the various theoretical frameworks they represent. Considers the development of diagnostic batteries based on such tests. Particular attention given to the significance of the theoretical perspectives in selecting and interpreting data collected. Prerequisite: Admission to Teacher Education program. A variety of instructional approaches within the various theoretical frameworks from which each evolved. Considers the development and evaluation of IEPs through an integration of learner characteristics, instructional approaches, and educational needs. Prerequisite: Admission to Teacher Education program. How to identify and implement evidence-based math interventions and strategies in both skill-based and inclusive settings. How to identify math disabilities, conduct curriculum-based math assessments, determine appropriate math interventions, assess the intervention outcomes, and adjust the interventions needed. Prerequisite: Admission to Teacher Education program. Evidence-based interventions and strategies and how to incorporate them into inclusive and skill-based settings. Evaluate research to identify evidence-based practice, implement that practice in daily teaching strategies, and keep current on emerging research studies that evaluate evidence-based strategies for teaching individuals with disabilities. The importance of analyzing outcomes of specific strategies or interventions and adjusting certain aspects in order to best individualize the learning of each student. Prerequisites: Admission to Teacher Education program; SPED 4240. The study of modifying student behavior using techniques of applied behavior analysis in a variety of educational settings. Candidates will research and discuss multiple techniques that improve behaviors in various environments. Positive reinforcement, evidence-based progress-monitoring tools, and assessment methods emphasized. *SPED 6710 only required of candidates seeking non-licensure. Choose the following if seeking licensure; otherwise, courses should be selected with consent of advisor. Overview of various approaches to behavior management. Application of various approaches in different special education settings. Basis of evaluation of various behavior change techniques. Prerequisite: Admission to Special Education: Modified program or permission of department. Addresses the knowledge and skills needed to develop and implement effective transition planning from school to adult life. Offers preparation for successful transition from elementary grades, career preparation education, and eventual transition to adult life. Explores a variety of tools, supports, and classroom strategies for creating successful transitions in preparation for adult life. Any course requiring admission to Teacher Education may require observations, case studies, or other time in K-6 classes. Persons who do not hold a license in special education but wish to work toward a master's degree in Special Education with a concentration in Mildly/Moderately Disabled Students may ask for an exception to the license prerequisite. This would allow the individual to complete a master's degree, but the degree would not lead to licensure. Persons who complete this degree will not be licensed to teach special education upon completion of the degree. Special Education, Severely/Profoundly Disabled Students Concentration, M.Ed. The Department of Elementary and Special Education offers the Master of Education degree with a major in Special Education and concentrations in Mildly/Moderately Disabled Students and Severely/Profoundly Disabled Students. The Mildly/Moderately Disabled Students concentration leads to 6-12 Interventionist licensure or K-8 Interventionist licensure. Applicants must take the Miller Analogies Test (and obtain a minimum score of 385) or the Graduate Record Exam (obtaining scores on the Verbal and Quantitative measures which normally exceed 146 and 140 respectively [current scale] or 400 [former scale] with a total combined score which normally exceeds 286 [current scale] or 800 [former scale]). Applicants must have a teaching license in special education for admission to the Special Education with a concentration in Severely/Profoundly Disabled Students program. Candidates without the appropriate license may be admitted to the graduate program as non-degree-seeking students. Once licensure requirements are met, the candidate may reapply for admission to the program in special education. A candidate not licensed in special education may apply for a waiver to the license requirement by signing a waiver form stating that he/she wishes to receive a master's degree in special education without a license to teach. The Master of Education in Special Education with a concentration in Severely/Profoundly Disabled Students requires completion of a total of 33-39 hours. Candidates must successfully complete a written comprehensive examination to be taken in the last semester of coursework (may be taken no more than twice). In-depth survey for professionals who will work with school age students who receive services in Special Education in one or more of the categories characterized as low incidence. Emphasis on cognitive, motor, social, communicative, behavioral, and physical characteristics of this population. Advanced methods and techniques for instructing low incidence populations. Evaluative and diagnostic instruments, environmental assessments, and other procedures used with very young and/or multiple disabled individuals. Understanding the concerns and needs of parents of children who have special needs. Also presents strategies and techniques for working effectively with parents. A problem-oriented course, on or off campus, planned and designed for individuals, a school faculty, school system, or other professional groups that will provide opportunities for pre- or in-service education related to assessed needs. Not more than 6 semester hours credit in independent study (SPED 6840) and/or problems (SPED 5260) can be applied toward a degree or licensure. Introduces students to adaptive/assistive technologies. The technologies will range from low-tech to high-tech and apply to the needs of school-aged students with disabilities. Includes assessing and supporting needs through the delivery of adaptive/assistive technologies. Persons who do not hold a license in special education but wish to work toward a master's degree in Special Education with a concentration in Severely/Profoundly Disabled Students may ask for an exception to the license prerequisite. This would allow the individual to complete a master's degree but the degree would not lead to licensure. Persons who complete this degree will not be licensed to teach special education upon completion of the degree. Register and call Testing Services at 615-898-2863 to make an appointment.